I try to connect to a Mongo Cluster hosted into Atlas (https://cloud.mongodb.com). 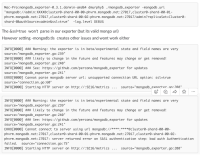 While using mongo client work fine (v3.4.10) and I can run db.serverStatus(). Is there any blog or forum where to discuss about this error ?